Show off the vintage style of this gorgeous Frye shoulder bag. Fashioned from weathered leather with shaped seaming details and stud accents, it has that I've-been-rocking-this-beauty-since-before-it-was-cool sort of look. The fine craftsmanship and ultra heavy-duty canvas lining will help keep you rocking it for years to come, too. 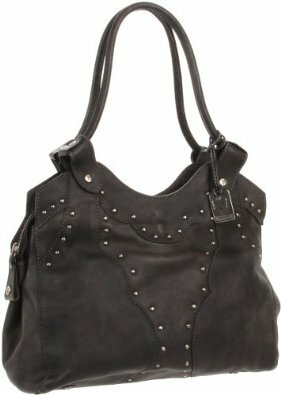 With funky studding on our hand-distressed, top-notch vintage leather, this pocketed shoulder bag looks fresh while keeping all your belongings in check.